Jesus Olmedo was born in the colourful Arganzuela quarter of Madrid in December, 1985. One of three children from a working class family, his precocious talent and innate love for Spanish dance led him to commence studies at the Madrid dance conservatoire when just eight years of age. His love of flamenco grew when, aged 11, he met his idol of the time, Joaquin Cortes, and at thirteen, further inspired by the music of singer El Potito, he decided to study Flamenco dance with maestro Rafael de Cordoba. Says Jesus of his most influential teacher. A continual flow of professional engagements ensued, and when he was 15, Jesus performed in the award -winning film “El Otro Barrio” alongside some of Spain’s best known actors. 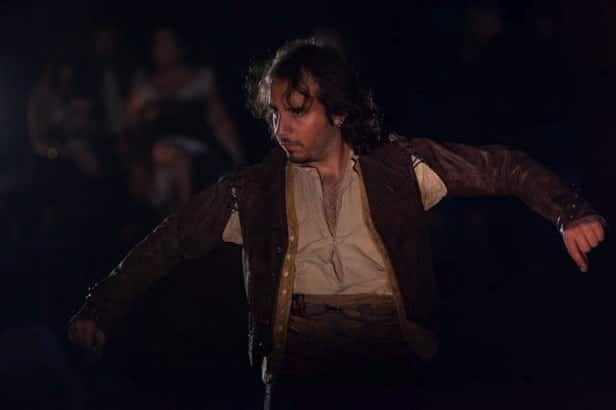 Television work and live performances continued alongside his studies, and at 18, “El Chacho”, as he is known to his friends, graduated with a title in dance from the Madrid Conservatoire. In the same year (2003) he joined the Flamenco company “Juanma” as principal male sololist, performing the premier of “El Raiz” with the Madrid Symphony Orchestra at the Teatro Real in 2004. Jesus was awarded, alongside his his friend and colleague Jorge Muelas, for their outstanding contributions as young artists to Spanish Dance, in a 2005 ceremony at the Teatro Albeniz in the Spanish capital. From 2006 to 2008 Jesus toured Spain intensively with the group of guitarist Alejandro Torres, before moving to Ibiza and forming the group “Querencia”, which performed there to public and critical acclaim. In Ibiza Jesus also began his career as a dance teacher and has found new inspiration in sharing his knowledge and experience of flamenco. Jesus arrived in London during 2009 to embark on his stage career. 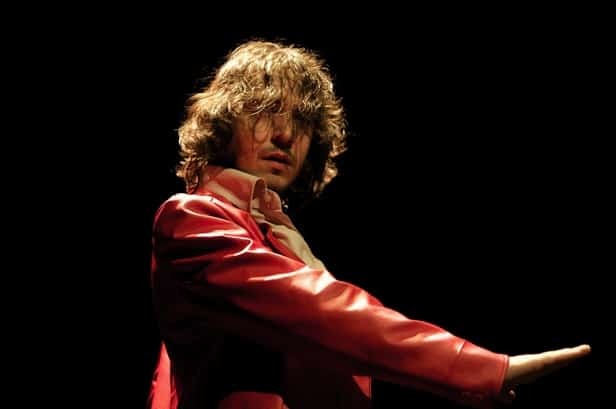 He soon became one of the most popular flamenco dancers in London performing in venues like Ronnie Scott’s Jazz Club and the Royal Albert Hall – consort. Jesus Olmedo was invited to Dubai as one of the star appearances of the famous international festival “Global Village Dubai 2012” where he was introduced to thousands of listeners via “Virgin Dubai 92” radio. In 2013, Jesus was selected by Riverdance Company to travel to Dublin amongst twenty top-skilled dancers from around the world. During the same year, Jesus appeared in the world’s media for being the flamenco teacher of Pippa Middleton, sister of Catherine, Duchess of Cambridge. Pippa, who writes a weekly column in The Telegraph, decided to write an article about her experience learning Sevillanas with Jesus Olmedo. singers like Anita Rachvelishvili, Roberto Alagna and Jonas Kaufmann. Recently, he has appeared in more than 100 countries and territories in the flamenco inspired FIBA Basketball World Cup title sequence, produced by Radiant productions on behalf of FIBA. Since 2008 Jesus has been teaching for private, group classes and is in demand for his popular workshops across the world. To date workshops have been conducted in Dubai (UAE), Edinburgh (Scotland), Cardiff (Wales), Madrid (Spain), Lima (Perú), Sydney (Australia), Christchurch, Auckland (New Zealand) and Hobart (Tasmania). During 2014 he worked in Australia with Diana Reyes and performed as the guest artist in The Great Southern Tour in the pacific with Marina Tamayo in more than a dozen venues across Australia, New Zealand, Tasmania and Fiji Island. In 2017, Jesús presents “Quejíos Negros” in the Flamenco festival in Lima (Perú) participating with great Peruvian artists like Leo Amaya & Ernesto Hermoza. Jesus is currently immersed in Spanish Accents project, a Jazz-Flamenco fusion band led by Alec Dankworth. Jesus has evident percussion skills and plays other musical instruments including piano and guitar, enjoys listening to The Beatles and acting; he is also a big sports fan.